Upmarket North Queensland holiday town with easy access to the Great Barrier Reef and the Daintree Rainforest. Port Douglas is primarily a popular holiday destination (an upmarket alternative to Cairns characterised by a proliferation of resorts) which offers a wide range of activities including trips out to the Great Barrier Reef's Outer Reef (often the vessels go to both Port Douglas and Cairns before heading for the reef); sailing excursions to nearby coral atolls; excellent golf courses; boutique shopping in the chic shopping centre; a huge range of holiday apartments and holiday accommodation options; and the tropical relaxation at the Sheraton Grand Mirage Resort with its golf course, neat rows of palm trees and huge upmarket apartments. Port Douglas was once a wild frontier town filled with itinerant seamen and gold prospectors. Very little of that wild frontier town is left. The village of Port Douglas is now a major tourist resort centre with fashionable arcades, well-heeled shoppers, and the tangy aroma of urban luxury. Port Douglas is located 1,750 km north of Brisbane and 68 km north of Cairns. Throughout its history Port Douglas has been known as Island Point, Terrigal, Port Owen and Salisbury. It became Port Douglas in October, 1877 when it was named after John Douglas, the Queensland Premier from 1877-1879. Flagstaff Hill (known simply as 'The Lookout') is located above Four Mile Beach and offers panoramic views along the beach and across the Coral Sea. It can be accessed by walking from the northern end of The Esplanade which runs along Four Mile Beach. It is also accessible from island Point Road. There is an outstanding lookout over Four Mile Beach. Four Mile Beach, with its hard white sands, has a reputation as one of the most attractive beaches in the area. A net is installed on a part of the beach from November to May in an attempt to protect swimmers from the box jellyfish. It is worth remembering that this is stinger water and they are genuinely deadly. Interestingly the beach is not four miles long. It was named after the Fourmile family. Port Douglas was nearly wiped out by a cyclone in 1911. Among other lesser buildings the cyclone destroyed a large store, the Exchange Hotel, the Catholic church and presbytery, the Government bond store and the tramway station and engine shed. The town never fully recovered. Consequently only three buildings are listed on the Queensland Heritage Register and only one of those buildings genuinely predates the cyclone. Located at 25 Wharf St the Port Douglas Court House (now the local museum) is the only significant public building (dating from 1879) to survive the cyclone that struck in 1911. This timber structure was designed by the Queensland Colonial Architect's Office and built by Thomas Watson to suit the oppressive tropical conditions. The building had a rectangular core with the court room at the front and two offices at the rear with verandas to all four elevations. Access to the veranda was via a centrally located stair at the front. Admire it and know that It is one the few surviving pre-1880s timber buildings in North Queensland; the oldest building in Port Douglas; and the second oldest timber court house in Queensland. For more detailed information check out https://environment.ehp.qld.gov.au/heritage-register/detail/?id=600465. Located in the old Court House in Wharf Street, the museum has been open since 1997. The exhibits can be inspected from 10.00 am - 1.00 pm on Tuesdays, Thursday, Saturdays and Sundays. It is the second oldest court house in Queensalnd and was erected in 1879 and restored in 1996. Among the most significant exhibits are a history of sugar cultivation in the district; a display recalling the Battle of the Coral Sea; the Fresnel lens from the Low Isles lighthouse; the importance of the Chinese to the local community; a display relating to Christie Palmerston's 'Bump Track' from Herberton to Port Douglas; and a display recalling Ellen Thomson, the only woman legally hanged in Queensland. She was arrested for the murder of her husband and executed at Boggo Road in Brisbane in 1887. For more information check out http://www.douglashistory.org.au/Court-House-Museum.48.0.html. Located in Wharf Street and built in 1913 after the previous Roman Catholic church, dating from 1880, had been destroyed by the 1911 cyclone, this small Gothic-style church is "a timber-framed structure with exposed exterior studwork set on low timber stumps. It has a steeply pitched gabled roof clad in corrugated iron. The building is rectangular in plan with a vestry off the rear corner and a small central porch at the front flanked by lancet windows. The porch has a gabled roof clad in corrugated iron and a side entrance and is lit by triple lancet windows. The side walls are braced by simple timber buttresses. The bearers and joists are of hickory ash and penda timbers and the framing is hickory ash." 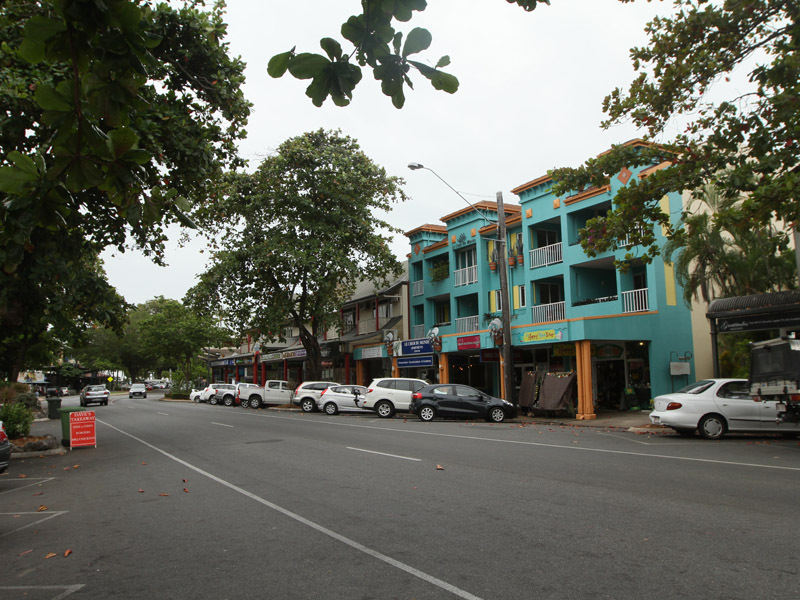 Although built in 1913 and consecrated in 1914 it is one of the oldest buildings in Port Douglas. It was relocated to its present site in 1988 and restored the following year. For more detailed information check out https://environment.ehp.qld.gov.au/heritage-register/detail/?id=600464. It is a non-denominational church. For enquiries tel: 0418 456 880. Located at 6 Dixie Street the initial building was constructed in 1904 and it was added to in the 1920s. It was an important part of the port and was used, mainly for shipping sugar, from 1904-1958. From 1979-1999 it was converted into a Shipwreck Museum by the noted diver, Ben Cropp. The Rainforest Habitat Wildlife Sanctuary, located on Port Douglas Road at the southern entrance to the town, is an ideal alternative to the Daintree Rainforest. Spread over 3.2 hectares it describes itself as "Wander through the large - wheel chair accessible - timber boardwalks thru the three distinct and unique Australian environments: The Wetlands, the Grasslands and the Rainforest. You can observe the Pelicans or the dancing giant water bird the Jabiru in the Wetlands, the Boyd's Forest Dragon in the Rainforests, and the Eastern Grey Kangaroos in the Grasslands. The spacious timber boardwalks allow guests to view the exhibits at different levels. Experience the rainforest from its spectacular lush tropical canopy to the dense forest floor. See the different types of fish, turtles and eels swimming in the clear ponds, or look at the sleepy fruit bats high in the canopy of the trees. The Rainforest Habitat Wildlife Sanctuary has two open air exhibits which allow guests the opportunity to see a diverse array of native Australian birds and marsupials in their natural environment up close and personal." There is more detailed information at http://www.wildlifehabitat.com.au. It is open from 8.00 am - 5.00 pm daily. Tel: (07) 4099 3235. It is not the function of this website to recommend cruises but the most popular ones at Port Douglas are those run by Quicksilver which has been plying the waters from the town out to the coral cay known as Low Isles and the pontoon located on the Outer Reef (Agincourt Reef) since 1979. The journey to the Outer Reef takes nearly an hour and arrives at a pontoon moored on the "quiet" side of the reef where visitors can dive and snorkel or, if they don't want to get wet, can sit in an underwater observatory and have short trips on a semi-submersible which sits just one metre under the water line. There is also an opportunity to have helicopter joy rides over the reef. For more details and prices check out https://www.quicksilver-cruises.com/reef-tour/wavepiercer. The Low Isles is a tiny coral cay located 15 km north-east of Port Douglas. It is only 1.6 hectares but it is surrounded by 22 hectares of unspoilt coral reef. The islands - there are two connected by a coral reef - were named by Captain James Cook in 1770 when he described it simply as a "small low island" and by 1819 it was officially Low Isles. A lighthouse was built on the island in 1878, weather data has been collected since 1887 and in 1928 a scientific expedition used the island as a base when they studied (it was an historic first) the ecology and structure of the reef. In 1979 Quicksilver started bringing people to the islands and in 2000 a Low Isles Heritage Walk was established. The island's lighthouse, built to help guide ships between Port Douglas and Cairns, is 18 metre high and was completed in 1878 and automated in 1993. It can be seen from 17 nautical miles and is built from timber with a galvanised iron exterior. The prime reason for visiting the Low Isles is to go snorkelling. It is better than the Outer Reef in the sense that you are on a beach and you go directly into the water which has over 150 species of hard coral, 15 species of soft coral, seven species of seagrass and a variety of sea creatures including green turtles, dugongs, sea cucumbers, parrotfish, angel fish, damsel fish, anenome fish, clownfish, rabbit fish, sweetlip, moon wrasse and fusiliers. For more information, prices and times check out http://wavedancerlowisles.com. There are a large number of cruise options available including two and three day cruises. For more detailed and up to date information check out http://www.infoportdouglas.com.au. Originally known as the Cape Tribulation National Park, and covering 16,965 ha, this area is now the Daintree National Park and covers 56,500 ha. It is an area of breathtaking beauty with mountain ranges rising sharply behind the narrow coastal strip and dense rainforest reaching to the edge of the beaches. With a bewilderingly rich variety of flora it is now recognised as the last extensive stand of undeveloped lowland rainforest in Australia (and possibly the oldest rainforest on earth) with such ancient species of fern as the beautiful flowering Idiospermum australiense and the Angiopteris, the world's largest fern. It is estimated to have existed for over 100 million years. Check out http://www.nprsr.qld.gov.au/parks/daintree-cape-tribulation/ which has a locality map which is downloadable. There is also the Poseidon Snorkel and Dive which departs daily from Port Douglas and visits three different sections on the Agincourt Reef. It is designed specifically for those wanting to snorkel and dive. Check out http://www.infoportdouglas.com.au/product/poseidon-snorkel-dive for more information. A similar trip is also offered by Silversonic Dive and Snorkel Adventure (http://www.infoportdouglas.com.au/product/silversonic). * Prior to the arrival of Europeans the area was home to the Kuku-yinanji Aboriginal people. * Port Douglas was established in 1877 when Christie Palmerston cut a road through the rainforest and down the mountain range to the coast. * Palmerston's track was known affectionately as 'The Bump'. In the early days the settlement at Port Douglas was known as Island Point, Terrigal, Port Owen and Salisbury. * By 1877 a wharf and stores had been built. That year saw the township named and surveyed. * Within weeks of its establishment the town was booming. There were an estimated 50 tent pubs, a bakery, a general store and rough accommodation. People poured in on their way to the diggings. * By mid-1878 there were 21 permanent hotels and a local newspaper, defined lots of land were for sale, and the mail was being delivered from Port Douglas to Thornborough on the goldfields. That year a roads board was formed to maintain the track to the goldfields. * A lighthouse was built on the Low Isles in 1878. * A Court House and a hospital were opened in 1879. * In 1880 tin from Herberton was being shipped out through the port. * Early the following decade the town had a population of 8000 and had overtaken Cairns as the most important port on the north Queensland coast. * The gold started to run out by about 1886 and the miners moved on to Papua and New Guinea. * Port Douglas was decimated by a cyclone in 1911. * The Port Douglas hospital was closed in 1935. * Port Douglas remained the port for the sugar mill at Mossman until 1958. * The primary school closed in 1960. * By 1968 entrepreneur Christopher Skase started thinking about a resort in Port Douglas. * In 1985 approval was given for the Sheraton Mirage resort with a 300 room hotel and 400 condominiums. * The Low Isles lighthouse was decommissioned in 1994. * Major tourism to Port Douglas did not start until the 1980s. Port Douglas Tourist Information Centre, Macrossan Street, tel: (07) 4099 5599. There are a number of websites. The most useful include http://www.pddt.com.au and http://www.infoportdouglas.com.au. Aboriginal art for sale in a shop on the town's main street. The war memorial at the bottom of the main street. The view of Four Mile Beach from Flagstaff Hill.